Discover the fun of simple craft making and story telling. Build easy-to-make crafts from everyday items and basic craft supplies such as construction paper, pipe cleaners, styrofoam balls and pom poms. Using their new craft creatures, Maggie (the host) & Jackson (her raccoon puppet accomplice) invite your children to act out amusing stories that will delight the whole family. 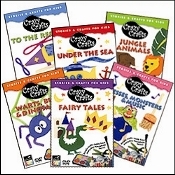 This series is perfect for ages 3 - 9, Crazy Crafts is a safe, imaginative way to encourage your children's ingenuity, creativity and language skills. A detailed craft list is provided for each story. Watch the story. Make the craft. Then have fun acting out the story!